Instead of having to remember to press the power button to turn Google Glass on or off, you can enable On-Head Detection instead. This feature activates Glass when it’s on your head and deactivates it when the device isn’t on your head. When Glass is off, the device is still powered on, but its touchpad, display, and audio are off, and it won’t pick up any incoming phone calls. Tap the Settings card bundle and then tap the On-Head Detection Settings card. Tap Calibrate on the resulting menu. When your Glass prompts you to do so, take it off for a few seconds. As you take the device off, the speaker plays a descending chime. Put Glass back on your head and then tap the touchpad. When you put the device on your head again, the speaker plays a rising chime, and you can interact with your Glass again. 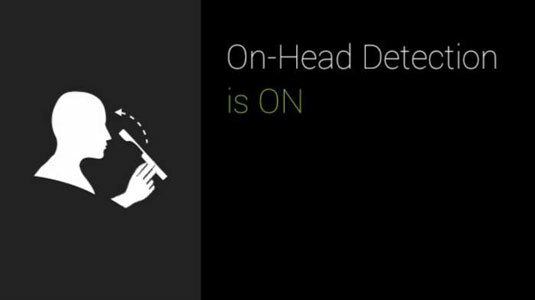 If you find that On-Head Detection isn’t working as well as you’d like, tap the On-Head Detection Settings card to turn off this feature. Then recalibrate On-Head Detection by following these steps.